Trying to copy someone's style, even if its a record holder, will be more detrimental than beneficial IMO. Each athlete has their own style of performing and it might not work for someone else. Instead try getting a "feel" for it when you're doing it. Try to "feel" your way into doing what you're supposed to be doing to perform better. Running is not like golf or other precision sport where you have to to everything according to technique. Altho there are certain guidelines for how to maximize your performance in sprinting, there is still room for personal style. My best advice is to try doing whatever makes you run faster. Before I started to work on my technique, whenever I sprinted my legs would roll outwards from a back view. I feel like I run a lot faster after running for 5 minutes with weights before an interval session. Look at Noah's foot as well as Hicham's. A still shot tells you next to nothing. You can't tell from that if he's heel striking and has just rocked forward into the flat position, if he's toe striking and his heel has just touched down before rebounding, or if he's midfoot striking and has just impacted the ground. I started to do every single interval session on my toes, and my heel never touches the ground, even when my foot lands. The only thing that touches are my toes and thats it. It does require more effort but is well worth it. 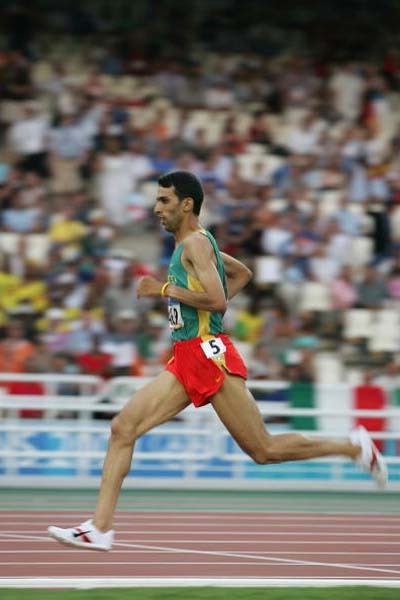 Now in a middle distance race, would you run on your toes like in the intervals or not. I just don't understand how landing on the balls of the feet, and then the rest of the foot flattening out backwards to the heel, it seems the direct opposite from any motion such as walking. In the pictures, you can clearly see their feet flat on the ground, there is no doubt about it. But how can you land on your toes, and then the rest to flatten out? Usually the foot straightens out from heel to toe, not from toe to heel. It sounds ironic how people say to run on the balls of your feet, and yet in pictures you can see the foot flat on the ground. Landing on the toes and then the rest of the foot flattening out is like running/walking backwards. Now in a middle distance race, would you run on your toes like in the intervals or not. I wasn't able to for anything over 800m. It was a combination of the muscular endurance and the pace being too slow to maintain the form, making it feel awkward. I just don't understand how landing on the balls of the feet, and then the rest of the foot flattening out backwards to the heel, it seems the direct opposite from any motion such as walking. Think of it like a spring board (diving) being compressed. It works very well. In fact when I first started toe running I felt like I was running lightly with no thrust or momentum. (I could not feel my weight pushing me forward, it was like a lag holding me back.) Now when I sprint on my toes I can even come close to challenging official sprinters at my high school even though I am long distance.